"These are the best, but don't tell grandma!" Preheat oven to 375 degrees F. Grease and flour a 9x13 inch baking pan. 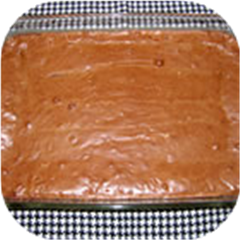 In double boiler over low heat, melt the chocolate and butter together, stirring frequently until smooth. Remove from heat and let cool. Bake for 17 to 20 minutes in the preheated oven, until the top is crackled. Let cool for 2 hours before cutting into squares.